Burmese days: Cruise along the Irrawaddy River from Mandalay to Bhamo (or Bhamo to Mandalay) onboard Paukan 2015. 20% discount on cruise and free domestic flight Bhamo to Mandalay or Mandalay to Bhamo. Direction of flight depends on whether an upstream of downstream cruise is selected. Flights Mandalay to Bhamo originate in Yangon, and the extra flight can be purchased. Flights Bhamo to Mandalay continue to Yangon, and the extra flight can be purchased. Embark Paukan 2015 in Mandalay at noon for lunch on board. In the afternoon visit Amarapura, former capital of Myanmar. See the famous U Bien Bridge, a three-quarter-mile-long bridge built in 1783 from reclaimed teakwood from the old royal palace in Inwa. The bridge is still a cornerstone of the community as locals and monks use it daily to cross Taungthaman Lake while fishermen and farmers go about their daily work below. Take a sampan ride on the lake for memorable views of the sunset behind the iconic bridge. Moor overnight at Mandalay. In the evening, enjoy a traditional dance performance on the sundeck. After breakfast, visit Kuthodaw Pagoda and Shwenandaw Monastery, the only remnant of former King Mindon’s “Golden City” to survive the bombing of World War II. Originally the king’s living quarters, the building was moved after his death to its current location and converted into a monastery. Today, the original gilding has faded, but the intricate wood carvings endure, giving you a sense of how extravagant the original teak palace complex was. Lastly, stop at a gold leaf workshop to see how it is crafted. After lunch, visit Mingun to see the unfinished pagoda (where construction was abandoned at 160 feet - only a third of the planned height), Mya Thein Tan Pagoda (White Pagoda) and the largest working bell in the world. After lunch, sail a short distance to Mandalay. Relax as we spend the morning sailing. In the afternoon, take a walking tour through the captivating pottery-making village of Kyauk Myaung. Here you learn more about the pot-making process and see how they are formed, fired, and glazed. Most interesting is the eye-catching 50-gallon variety, often referred to as Martaban or Ali Baba jars in colonial times. These pots could transport large quantities of liquor, fish sauce, or peanut oil, and have played an important part in maritime trade throughout Asia for centuries. After the excursion the ship enters the third defile of the Irrawaddy River. Enjoy riverside scenery as the ship sails the entire morning. In the afternoon, visit Tagaung, an old city which is located on the east river bank. Stop to admire the colourful vegetable market. Visit the small village of Tigyang for an afternoon walking tour through its narrow lanes and visit the pagoda and reclining Buddha on a hilltop with stunning views. Moor overnight mid-river. Start the day with a visit to the local market in Katha, to see locals busy buying and selling fish, meat and a variety of produce. A visit to the former British Club, featured in George Orwell’s novel Burmese Days is fascinating as you learn a bit more about how life was during British rule. Lastly, travel a short distance to a local Jingpo village. A subset of the Kachin, the Jingpo are one of over 100 ethnic minority groups in Myanmar. Learn about their culture, traditional dress, and their unique method of making rice wine. Sail the rest of the day. During the morning explore the fascinating island village of Kyun Daw , where over 7,000 stupas surround the monastery. Take a walking tour to meet the villagers and visit a school to interact with the children. A much appreciated visit is made to a nunnery to present the nuns with food purchased the day before at the market in Bhamo. Unlike monks, they have to collect and cook their own food. The ship sails south throughout the afternoon and it’s sometimes possible to catch a glimpse of the rare Irrawaddy dolphin with its distinctive round forehead. 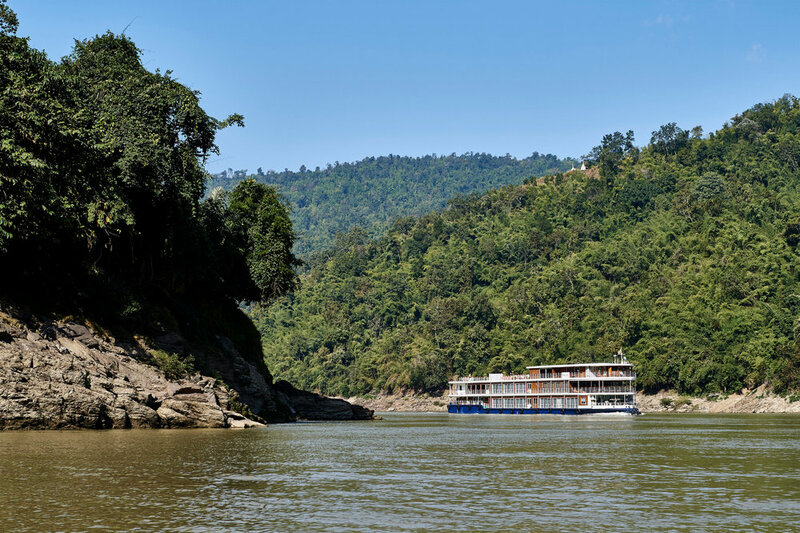 Around early evening the ship crosses the spectacular second defile, the largest of the Irrawaddy gorges, with its magnificent cliffs towering along the narrow channel. In the evening, join your Cruise Director and ship’s crew for a special farewell reception and dinner. After breakfast, explore Bhamo by tuk tuk and on foot then transfer to the airport for your flight to Mandalay. If continuing onward to Yangon, the additional flight is not included in the cruise price. Note: Due to water level, a speed boat may be used for transfer from the ship to the jetty. Lunch box provided by the ship. This itinerary is available in reverse (downstream) in which case, the flight from Mandalay to Bhamo is included in this offer. Accommodation onboard Paukan 2015, all meals & Coffee/Tea/Water, complimentary local beer throughout the cruise, a glass of wine at lunch and dinner, sightseeing as described in the Itinerary, English speaking guide, all entrance fees. Other drinks, laundry, all items of a personal nature, health-accident-baggage or travel protection plan outside the ship’s boundaries, fuel surcharges if applicable. Pricing from USD 2,518 per person sharing a double room (main deck cabin). Port charges USD 140 per person. Explore the Ganges River on this 7 nights cruise itinerary onboard the Ganges Voyager I, Ganges Voyager II or Bengal Ganga and take advantage of this incredible offer including 2 nights free stay at the Oberoi Hotel in Kolkata. The itinerary may change depending on the departure date. After breakfast embark on a panoramic tour of Kolkata, featuring a view of the well preserved British colonial buildings in Kolkata: Writer’s Building, General Post Office, High Court, Raj Bhawan (Governor’s House), Town Hall, Council House, Treasury Building, Reserve Bank of India and Dalhousie Square. The day continues with a visit to St. John’s Church. Next highlight is the recently renovated Victoria Memorial Museum, which houses the largest collection of British colonial historical artefacts in India. Return to the ship and commence upstream journey passing below the cantilevered Howrah Bridge seeing various colonial buildings along the Ganges river. Moor for the night on the outskirts of Kolkata city near the Bally Bridge. Overnight onboard Ganges Voyager. In the morning set sail upstream to Bandel, meaning port in Bengali which was founded by Portuguese settlers who built the Church and a Monastery around 1660. After lunch visit the Basilica of the Holy Rosary commonly known as Bandel Church, which is one of the oldest Christian churches in West Bengal. Thereafter, a worthwhile visit to the Hooghly Imambara, one of the famous Shiya pilgrimage centres in West Bengal, built in 1841 by Haji Mohammad Mahasin. The two-story building and surrounding rooms provide housing for pilgrims as well as classrooms, or Madrasa that teach the Koran. The structure contains a Victorian-era clock with a winding key weighing 20kg. Large Persian chandeliers and lamps light the Imambara’s stunning hallways and passages. Sail further upstream today to the temple town of Kalna. In the afternoon enjoy a rickshaw ride through the town centre of Kalna en route to the enchanting Rajbari Temple Complex, which has the highest concentration of temples in the region. Bengal’s mixture of temple architecture includes the Nabakailas Temples. There’s a stop at the local market before returning to the ship. Moor at Kalna tonight. Overnight onboard Ganges Voyager. Today the ship sails onward to Mayapur, known as the birthplace of Sri Chaitanya Mahaprabhu (1486) who is considered an incarnation of Lord Krishna. It is also the home of the Krishna Consciousness Movement also called ISKCON. Guests can experience the fascinating culture of these followers and their ornate, colourful decorated statues of Krishna. The new temple built to commemorate the Jubilee year of the ISKCON movement in 2016 and largely funded by Alfred B. Ford, the great grandson of car-maker Henry Ford, can be compared to the Vatican. It also contains a 75-foot domed planetarium. Meet Krishna followers and walk through the pilgrim’s bazaar. Moor at Mayapur for the night. Overnight onboard Ganges Voyager. Downstream sail to Guptipara, a rural town located on the riverbank. The paddy fields of Guptipara produce the finest rice in West Bengal and the area is also famous for the “Himsagar Aam”, the tastiest mango on Indian soil. We visit the Temple complex at Guptipara, which houses four great Vaishnava Temples, namely Chaitanya, Brindabanchandra, Ramchandra and Krishnachandra. In the afternoon, a quick sail across to the opposite riverbank for a visit to the weaving village of Fulia. Fulia specialises in a combination of jacquard and jamdani work, which are based on Tangail Saree Culture of Bangladesh. Moor at Fulia. Overnight onboard Ganges Voyager. In the morning sail further downstream to Chandernagore, which was established as a French colony in 1673. Explore the French colonial buildings walking along the promenade, including the former French governor’s residence, now converted to a museum that features an exhibition of items that depict life during this period. Also visit the Sacred Heart Church, designed by French architect Jacques Duchatz. Return to the ship and continue the journey back to Kolkata. Overnight onboard Ganges Voyager. Following breakfast disembark the ship and transfer to the airport for flight departure. 2 nights’ hotel accommodation in Kolkata at the Hotel Oberoi Grand or similar in standard room including breakfast, all transfers as indicated in the programme, 7 night accommodation onboard the Ganges Voyager I or Ganges Voyager II or Bengal Ganga, full board during the cruise, complimentary Indian brand mineral water, tea and coffee during the cruise, welcome & farewell receptions, entertainment and cultural activities onboard, all the excursions with dedicated guides as indicated in the programme, English speaking crew onboard, port charges. Pricing from USD 3,719 per person sharing a double room (Ganges Voyager I and II). Pricing from USD 2,100 per person sharing a double room (Bengal Ganga). Port charges USD 179 per person. Easter Special Offer - Enjoy a free meal upgrade. All inclusive for the price of half-board. Get on or off at any of the five boarding points along the River Tiber. The boats operate from early April to late October, from 10:00 until 18:30. There is a boat every half hour. Ticket valid 24h: €18 adults, €12 children between 11 and 14 years old, free of charge for children under 10. Enjoy a romantic 4-course dinner while cruising through Rome. The boats operate every Friday and Saturday from early April to late October, departing Sant’Angelo Pier at 21:00, returning 23:30. Enjoy a fixed 4-course dinner with water and coffee included. Prices: €65 adults, €47 children between 4 and 10 years old, free of charge for children under 4. Enjoy an aperitif while cruising through Rome. The boats operate every Sunday, Monday and Thursday from early April to late October, departing Sant’Angelo Pier at 17:00, returning 19:00. Enjoy a glass of wine or non-alcoholic drink with a platter of typical appetisers from Rome. Valid for stays from 01 March to 30 April 2019. Book by 30 April 2019. Applies to single or double rooms on half-board plus basis. Discount does not include Green Tax. Deduct Green Tax before calculating discount. Not applicable to extra adult or child. Applicable for minimum of 3-night stay. Cancellation of existing bookings and re-booking will not be entitled to the offer. This offer cannot be combined with any other accommodation discount (including contracted EBO and FREE NIGHT offer). 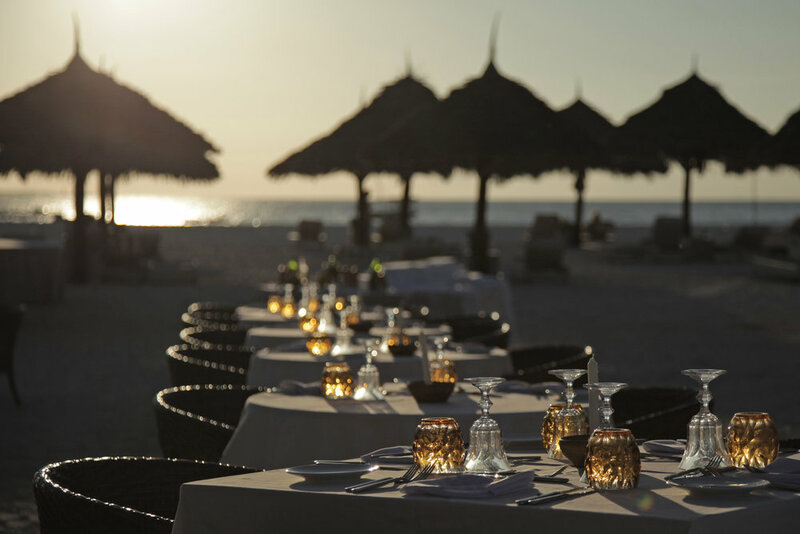 Free Meal Upgrade Offer - book half-board plus and get full-board plus or book full-board plus and get all inclusive. Valid for stays from 01 March to 30 April 2019. Book by 30 April 2019. Applicable for minimum of 3-night stay. Meals cannot be exchanged for cash. No compensation will be given for unused meals. Cancellation of existing bookings and re-booking will not be entitled to the offer. Free upgrade from Beach Villa to Lagoon Villa. Free upgrade from Beach Suite to Lagoon Suite. Book half-board plus and get full-board plus. Book full-board plus and get all inclusive. Book by 30 April 2019. Valid for stays from 01 March to 24 December 2019. Applicable for minimum of 4-night stay.